How can I remove the US layout? UPDATE 1: I just updated my desktop and it hasn't added a US keyboard! UPDATE 2: I added a third language (French) and was able to remove it, the button was enabled. The US remove button remained disabled both after adding French and after removing it. Finally found a solution using PowerShell. now you can check again your new language list with Get-WinUserLanguageList Logoff, Reboot. After rebooting you can add another languages if needed. Just trying to improve naduvko's answer. You can directly specify the entire list of languages when running the PowerShell script. The first one (en-US in this example) will be the default. On my Windows (Version 10.0.16299.371) I have a Set as default button that seems to be replaced with the arrows in your interface. Try to make the UK the default. That would unlock US for removal. Not the answer you're looking for? Browse other questions tagged windows-10 keyboard-layout input-languages language-bar windows-10-v1803 or ask your own question. 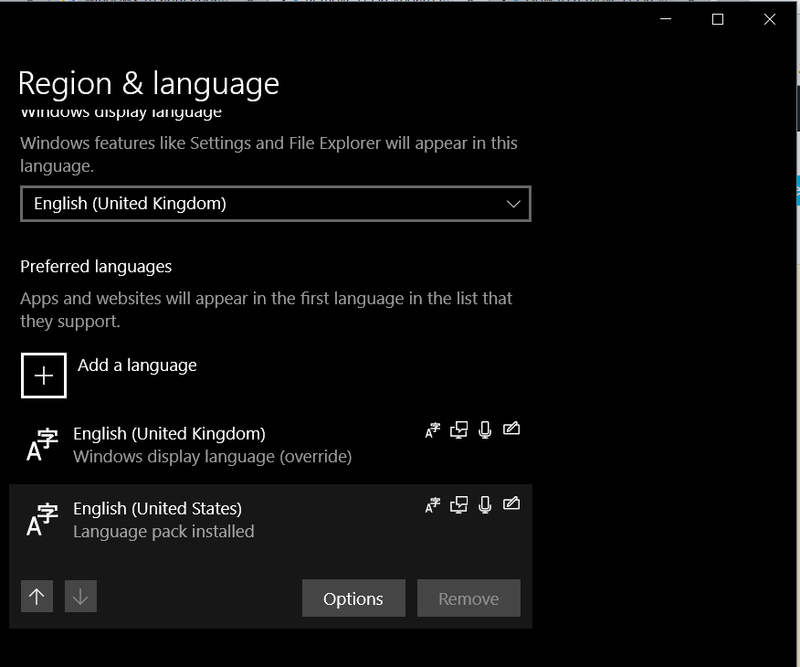 Reinstall Windows 10 Pro (UK) to another system language (US)? Windows 10 Language and keyboard settings: How do i get rid of an input method combination i do not use? How do I prevent source engine based games from adding the English US keyboard layout?